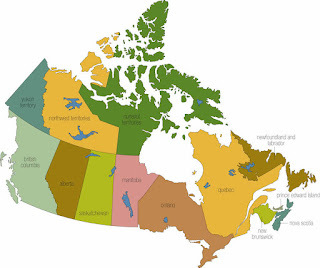 It is impossible for me to select just one area of Canada to visit. Canada is definitely a destination that my husband and I both will visit someday. Since we live in Oregon, we will most likely visit by driving up through Washington and into Canada. We are parents to a 10 year-old baby dog that cannot be boarded due to an ongoing illness so travelling is pretty nonexistent unless it is fairly close and we can bring him with us. Seeking out tidbits of interesting facts about each destination is so much fun. I hope you enjoy reading them as much as I had fun finding them. Did you know that Canada is the second largest country in the world! Wow!!! In case you are wondering, Russia is the largest with the United States coming in at third place. Half of the country is covered with forests. That means that one-tenth of the world’s forests are there. Almost half of the population in Canada were born in other countries. I understand that dog food is tax-deductible in Canada. Could that be true, and if yes, how wonderful! Canadians like to finish a sentence with the word Eh. For some reason, that makes me smile! Baseball fans have Canada to thank for the baseball glove. It was invented in Canada in 1883; However, hockey and lacrosse are Canada’s national sports. There are a lot of smart people in Canada. Their literacy rate is over 99%. There are a lot of HAPPY people living in Canada! Thirty two percent of Canadians are very happy, 55% are quite happy. It appears from the research I've found, Canada is a bilingual country with French and English recognized as the nation’s national languages. Isn't that wonderful. I wish I would have learned another language. 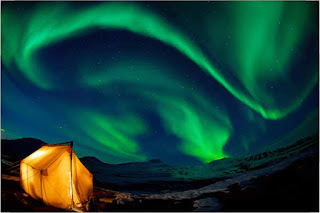 One phenomenon that occurs in Canada that I must see in person before I leave this planet, it the aurora borealis, which some also call the Northern Lights. Regardless of what it is officially called, I must see it in person someday. Now my first stab at creating the souvenir was a bust. I researched all kinds of information about the colors, sky, movement, etc. I guess the gases in the atmosphere can reflect a whole rainbow of colors. So instead of trying to be so literal (my left brain trying to take over! ), I allowed myself to 'see' differently. This seeing allowed my right brain to drift and slowly allow a general idea of the souvenir. Sounds crazy I know, but I am not a person who can plan out the project BEFORE doing it. I have to just jump in and create with just a general feel for what I'm going for. Allow me to introduce you to my version of the aurora borealis. Isn't it just the cutest thing you've ever seen! I had such a great time creating it. It's a perfect hot pad size, but I doubt I could ever allow anything to sit on it. At least not just yet. How to draft any size hexagon you want. How to make and sew hexagons (videos will be available). 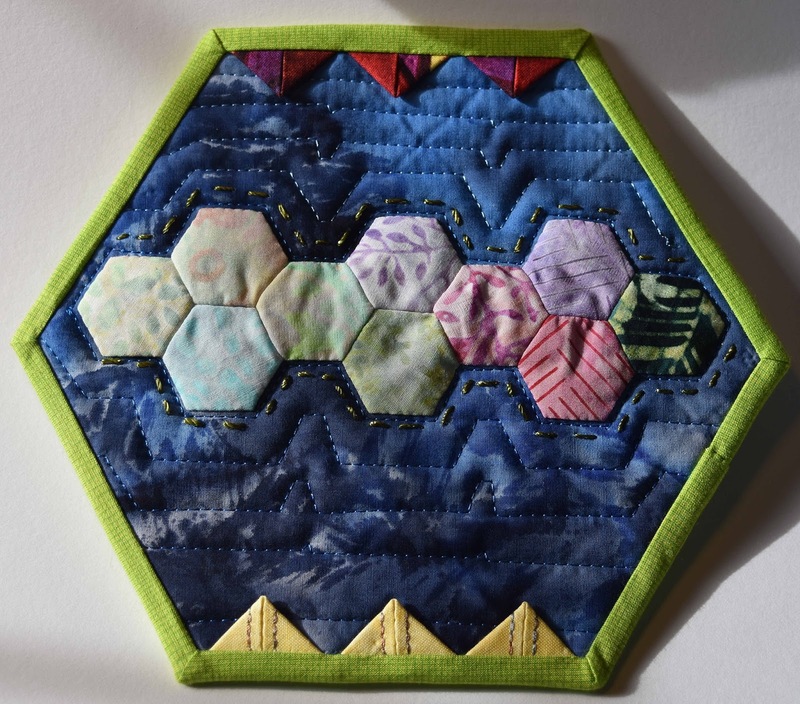 If you have never played with hexagons yet, I hope you will give it a try. There are only 10 little ones and they sit on one big one! How to sew binding on a hexagon shape that doesn't have 90 degree angles. Normally, I post this post and at the same time, I send the pattern to the travelers. This time, however, I need a little more time to get the instructions out of my head and into the computer. What that means to you if you are just reading this post is that you have time to request your passport and jump on the plane. You must submit a comment below telling me you want to come along. Leave your email or I cannot send you the instructions. Also, please become a follower of my blog. Just as a reminder -- check out the top of tab, Travelers Souvenirs. If you have finished a souvenir, please add a link to your page so others can be inspired by your art. Thank you Karen for being the first brave soul to post a link. Now, who is going to be next! How fun!!! Are those beads that I see? Looking forward to joining in on the fun. Hi JoJo, I'm really looking forward to making the Canadian northern lights project - it's at the top of my to do list! Yes, we have a reputation for saying Eh! although most of us don't do it often and don't realise we say it :-) Hope you get the chance to come visit us up here some day.